Simply keep reading by scrolling down this page for general information what laser skin care is all about, move into more specific information by selecting one of the options below, or schedule a consultation by calling 917-703-7069 or clicking here. Continue reading below to learn about what laser skin care is all about. Click here to learn more about treating common skin imperfections like large pores, acne scars, stretch marks, and fine lines with fractional laser resurfacing. Click here to learn more about treating sun damage and broken capillaries with IPL. Click here to learn more about cosmetic laser treatments like The LiteTouch Laser Facial™. What skin conditions can lasers be used to treat? TEXTURE problems like large pores, acne scars, stretch marks, and fine lines or wrinkles. COLOR problems like sun damage, freckles, broken capillaries, and hyerpigmentation. CLINICAL conditions like melasma and rosacea. COSMETIC treatments like The LiteTouch Laser Facial™, The LiteTouch Laser Peel™, or a Photofacial. What are the most commonly treated skin care problems? Sun Damage and Freckles: Color problems like sun spots and dark freckles are two of the most common skin care conditions that can be treated with lasers, specifically Intense Pulsed Light therapy (also known as IPL). An experienced practitioner will evaluate each spot or freckle individually and tailor the settings to treat each one based on the darkness or lightness of the pigment. Different colored pigments require completely different settings and laser attachments to treat effectively, and this highly-skill customization is what differentiates a real IPL treatment performed by a physician from a simple IPL photo facial performed by an aesthetician. Click here to learn more. Broken Capillaries: Red or blue blood vessels commonly found at the corners of the nose and across the cheeks, as well as tiny red dots called capillary hemangiomas, can be quite difficult to treat without the proper technology. 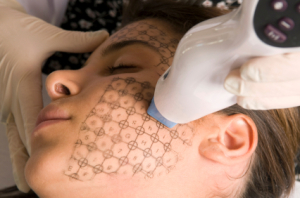 IPL and OPL are the most effective technologies used for blood vessel conditions like these, but the machine must be able to deliver a high level of highly focused energy into the vessel without damaging the surrounding skin, and just as with sun damage and freckles, the the settings and equipment must be customized to the exact depth of color of the vessel. Failure to evaluate and treat each vessel individually will always result in an inadequate treatment or damage to the surrounding skin, so make sure you practitioner is not only experienced, but also has the best technology available. Click here to learn more. Large Pores: We all want poreless porcelain skin, but few of us actually have it. Large pores are very very common in both men and women, but they can be diminished and shrunken with a series of skin resurfacing treatments. Our favorite technology for large pores is fractionated, non-ablative laser resurfacing that is used in one of our signature laser skin care treatments, The LiteTouch Laser Facial™. Acne Scars: Acne scarring is incredibly common in both men and women, and can range from mild to quite severe. The most common misconception about acne scars is that they are a superficial imperfection. They aren’t superficial at all, in fact, they penetrate quite deeply into the skin and usually require a significant level of resurfacing to treat. Superficial chemical peels are usually not effective in treating anything but the most mild acne scars, so we routinely treat them with a fractionated, non-ablative resurfacing laser for approximately 3-5 treatments. Only a fractionated laser can penetrate deeply enough to heal the deepest layers of the skin where these scars are formed, and only a non-ablative laser can do with with a minimal amount of downtime. Click here to learn more. Stretch Marks: Stretch marks require the deepest penetrating laser technology available for a successful treatment. Since stretch marks are essentially tears in the skin that usually extends through all layers, including the dermis, the collagen stimulation necessary to heal such a scar has to occur at the deepest level possible. A fractional, non-ablative laser with a special deep penetrating hand piece is necessary for these types of treatments, which take about 30-60 minutes depending now the number of areas being treated (most commonly the breast, love handles, abdomen, and hips). The stretch marks are quite red after the treatment for about 2 days, and must be kept out of the sun for 1-2 weeks. The marks will begin to fade in as little as 2-3 treatments, but most patients require 3-5 treatments for best results. Click here to learn more. Since it is rare to have only a single one of these common skin issues, we usually perform combination laser treatments to address several problems at once. For example, fractional resurfacing treatments for acne scars are frequently combined with a Laser Facial, and treatments for large pores are frequently combined with IPL for broken capillaries. If you have more than one of these skin care problems, it’s always best to schedule a skin care consultation prior to any actual treatment so Dr. Vendemia can examine your skin and develop a treatment plan based on the results of that examination. What is the difference between ablative lasers, non-ablative lasers, fractional lasers, and IPL? ABLATIVE LASERS: Ablative lasers used to be the gold standard for laser skin resurfacing, but are slowly being replaced with more gentle and more effective non-ablative technologies. An ablative laser removes the entire top layer of skin, which then regrows with a smoother texture and more uniform color. The amount of skin removed can be carefully controlled by the practitioner, but it requires a very high skill level and experience, and should only be performed by physicians. The results with ablative resurfacing are usually outstanding, but the downtime can make this a less-than-ideal option for some. NON-ABLATIVE LASERS: Non-ablative lasers to not burn away layers of skin like ablative lasers do, and therefore the downtime is significantly less. A non-ablative laser heats the deep layers of the skin to encourage a healing response and collagen production that speeds up the normal process of skin slough. As the deep layers of skin heal and grow, the top layers of skin are slowly replaced with fresh, new skin. The downtime after non-ablative resurfacing treatments is significantly less than after ablative treatments, which is why non-ablative skin resurfacing is becoming the new gold standard for laser skin care. FRACTIONAL LASERS: Fractional lasers penetrate the skin at only certain points, and leave intervening patches of skin untouched. This allows for faster healing times and less downtime because the undamaged skin islands are able to help generate a faster healing response. Fractional lasers can be either ablative or non-ablative, and are not synonymous with Fraxel®. Fraxel is only one company that produces such technology, and serves as a brand name only. It is not the only, nor the most advanced, option for fractional laser resurfacing treatments. INTENSE PULSED LIGHT (IPL): IPL and the newer generation OPL (Optimized Pulsed Light) are not true “lasers” in the most literal definition of the word. Rather than a hyper focused beam of light meant for cutting or burning used in other laser treatments, IPL and OPL are very intense pulses of visible light that are absorbed into red, brown, and blue pigments in the skin and blood vessels. When a sufficient amount of this intense light is absorbed, brown pigments will be reabsorbed by the body, and dilated capillaries and veins will collapse. IPL and OPL are commonly used to treat sun damage, freckles, broken capillaries, and capillary hemangiomas, and are also marketed under the term Photofacial for more generalized cosmetic treatments that produce a more uniform skin tone by treating color problems like those described here. What is the difference between resurfacing lasers and Radiofrequency or Infrared Skin Tightening lasers? More information coming soon, but please feel free to give us a call at 917-703-7069 in the meantime to find out more about our laser skin tightening options or to schedule a consultation. Treating melasma with a fractional non-ablative laser. Melasma is one of the most difficult clinical conditions to treat because of the frequent misdiagnosis as sun damage by inexperienced practitioners and aestheticians, and because of the depth of the pigment. Melasma can often look similar to sun damaged skin, but it is crucial to differentiate between the two conditions because the treatments are completely different. Treating melasma with IPL or OPL as you would for sun damage could result in a noticeable worsening of the problem, which is a phenomenon we see frequently when patients visit us for a second opinion after being treated at a medi-spa or another doctor’s office. Laser treatment are almost always necessary to break up the deep pigment of melasma, which is why few patients have success with creams and ointments alone.Click here to learn more about the specifics of treating melasma with a fractional non-ablative laser. Treating rosacea with IPL and OPL. Rosacea is similar to melasma in that it is also one of the most difficult skin care conditions to diagnose and treat, but the actual treatment is very different. Rosacea is characterized by red flushing of the cheeks, nose, and chin that worsens with “triggers” that are different for every individual, but commonly include sun, hot weather, spicy food, alcohol, and harsh skin care products. The pathology behind rosacea is an intense inflammation of small capillaries and blood vessels in the skin, so IPL and OPL are usually the most effective treatment methods. Laser treatments to some degree are almost always necessary to bring rosacea under control, which is the reason why many patients find little success with creams or pills alone. Click here to learn more about treating rosacea with IPL and OPL.